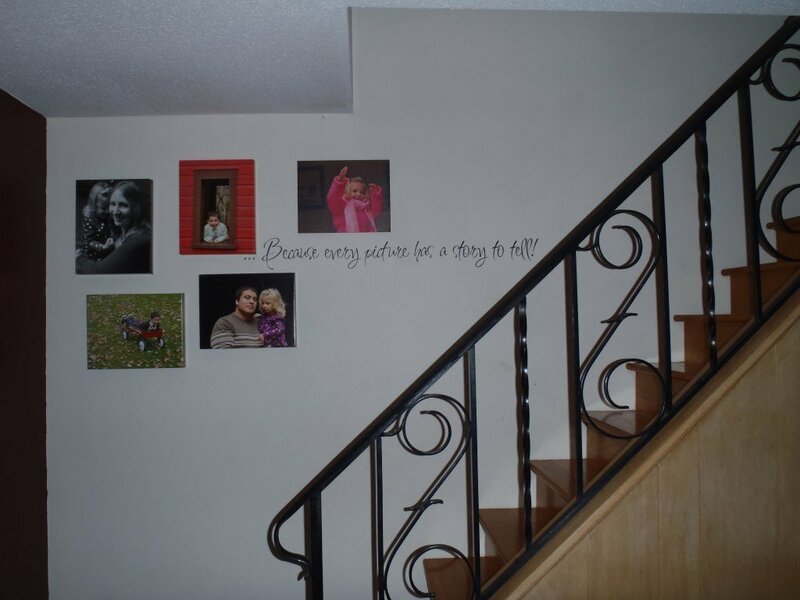 I have always loved homes where people have pictures of their loved ones artfully placed as you walk up the stairs. Cute pictures of kids, fun family moments, or just things you want to remember. This is something I have always wanted to do in my home, but the location of my staircase makes a tradition photo setup seem odd to me. This is when I decided I was going to create a canvas wall and use the wall adjacent to my stairs as the backdrop. If you have been reading the blog for a while, you may know that I have mentioned this before and I was lucky enough to get a couple of canvases to try out for free. Add those to ones I had already purchases and I am well on my way to filling up my wall! My goal is to add a couple of canvases each year as the kids grow. It will be a sort of staircase of memories if you will. Still, even with the pictures I felt like something was missing. It just seemed a little plain. Then I started looking at all those vinyl wall decals and thought something like that would be a great addition to the space! I had the opportunity to try out a decal from Right On The Walls, and I am thrilled at the results! I think it looks fabulous and the decal was super easy to put up! You just remove the peel from the back, put it where you want it, smooth it on with the provided tool, and then remove the top layer. You do have to go slow and remove it carefully, especially with some of the smaller letters just to make sure they don’t come off the wall, but if you take your time you should have no problem! Would you like to win a vinyl decal of your very own? If you win you can choose any vinyl up to $25. If you would like to win enter for your chance on the form below (US 18+). Disclosre: The Mommy Bunch was provided a free product to facilitate this review, however, all opinions are strictly our own.